can sometimes be a little tricky finding those that really matter to you and making sure that you get to know about the top opportunities before everyone else. TESconnect are proud to be the biggest online education recruitment site on the web, but we also understand that with all these jobs it can sometimes be a little tricky finding those that really matter to you and making sure that you get to know about the top opportunities before everyone else. That's why we offer our Job Alert service, an easy way to stay ahead of the game and take the pain out of searching for your perfect job. TESconnect Job Alerts are an easy way to stay up to date with the latest employment opportunities. We will only send you the jobs that are suited to your needs, so you don't have to worry about missing the right opportunity when it comes along. Simply tell us what kind of jobs you're looking for, we'll do the rest. Create as many Alerts as you like and select how and when you would like to receive them: via Email or SMS direct to your mobile phone, daily or weekly. That's it! All the right jobs sent to you as and when they become available, so all you have to worry about now is updating that CV. First of all, if you have not already done so, you will have to register on TESconnect. This is free and easy and can be done here. You will receive an account activation email containing a link which you will have to click on before you can start using your account. 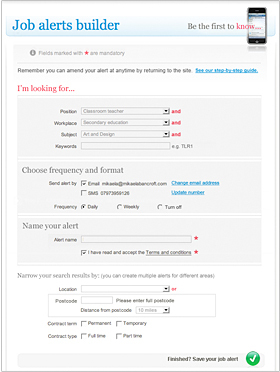 Once you've done that you can create your job alerts in the following way: Just login to TES connect and visit the Job Alert Builder to get started. Tell us exactly what kind of jobs you're looking for, set the frequency, format and name your alert. Finally, save your alert. You will then start receiving your notifications as soon as relevant jobs become available.